Note: Windows ad wrap free ! Good ad wrap means not obliterating the vision through windows hey? Media: Can we please see out of & into buses, trains, trams & ferries? We were delighted that the Greens Candidate for Brisbane Lord Mayor Ben Pennings raised the issue of all over wraps on public transport vehicles making it difficult for passengers to know their location, particularly at night or when wet (1). There is also a potential security issue with all over wraps as it is not possible to see into the vehicle. A wrapped bus for example, would be a much more obvious target for evil doings than an unwrapped bus. On a visit to Brisbane CBD I noted an increased number of buses with limited advertising. Blocking these windows is treating the public with contempt in our opinion. Is ad wrap placed over windscreens? No it is not as the driver has to see out of the vehicle, so why are passengers blocked from seeing out of vehicles too? Public transport vehicles are constructed with windows for a reason, it is not for ad-wrap! We call on the Minister for Transport to direct that ad-wrap be removed from at least 95% of windows on public transport vehicles. Interesting to note that an International Visitor to our region highlighted the scourge of ad wrap yesterday.
" The rather limited view from #GoldCoast light rail thanks to the hideous exterior advertising wraps. " There are real problems with ad wrap on buses, trains, ferries and trams. Public transport vehicles are built with windows for a reason, so passengers can see into and out of them. They should not be blocked. This is very disorientating for passengers, particularly at night or when wet, and also makes it very difficult if not impossible to see into the vehicle. The blocking of window vision could have serious safety and security implications as well. We call on the Minister for Transport Mr Stirling Hinchliffe to direct that all wrap be removed from windows from public transport vehicles. It is possible to have well placed ad wrap that leaves window vision intact. "We call for the removal of advertising wraps from window areas on all public transport vehicles, trains, buses, ferries and trams." The Transport Authorities' lack of response to the scourge of ad-wrap is symptomatic of the wider issues. It is as if they have contempt for public transport passengers. Despite constant feedback that ad-wrap is very disorientating for many, and is in fact a genuine security risk they ignore our pleas to remove it. Public transport vehicles have windows for a reason - it is not for ad-wrap. Public transport in SEQ is headlong into failure. The problems with Queensland Rail were seen to be coming and we highlighted those concerns. A list of a few more concerns with public transport in SEQ. 1. Organisational structure - a circus of mismanagement with TransLink, Brisbane City Council, Queensland Rail, and the State Government sitting in silos of replication and inefficiency. Politics dominates sound policy. No wonder little actually gets achieved. 2. Brisbane bus network - needs urgent reform. 3. Brisbane Metro - as proposed an absurdity. The State Government has failed to challenge this with the end result that Brisbane ratepayers money is being wasted on a nonsense, and Prime Minister is attempting to link funding of Cross River Rail to the Brisbane ' Metro ' which has to be one of the most perverse outcomes for public transport in SEQ ever! 4. The simple things, like all door boarding on high frequency buses is too hard for Queensland. Logical arrangement of CBD bus stops too hard! 6. Failure to convert Victoria Bridge into a bus and active transport bridge only. Massive bus network failure looms. 7. Snail pace fare reform - is to eventually happen, hopefully in January 2017, but we cannot be to confident can we? 8. New Generation Rollingstock trains - clearly problems, trains have been in Queensland since February 2016, none have seen a passenger yet. 9. Failure to clarify fare policy on rail replacement buses - despite assurances that this would be done. 10. Ongoing signalling issues with Petrie - Redcliffe Peninsula line. Not a pretty list is it? But that spells out the mess it actually is. Want a cash bonus with that? Should, God forbid, there be a protracted terrorist incident on a bus with ad wrap (possibility very, very remote, I know), but what would the authorities do if they needed intel on what was occurring on the bus? Maybe we should approach them for their opinion on this circumstance, perhaps they could access CCTV cameras on the buses. But if they were to be disabled or painted out, it's back to the ad-wrap windows for visuals. RAIL Back On Track (http://backontrack.org) a web based community support group for rail and public transport and an advocate for public transport passengers has said it is time to remove advertising wrap from the windows of all public transport vehicles. "There has been an increasing use of all over advertising wraps on buses, trains, trams and ferries for a number of years now. These advertising wraps usually cover windows and block clear vision." "Public transport vehicles have windows for a reason. It is to allow passengers to see out of and into public transport vehicles. Is ad-wrap applied to obliterate windscreens? No, of course not, so why do transport authorities treat passengers with contempt and block the windows? Why are public transport vehicles built with windows?" "We have had feedback from the public and members that these wraps do make it difficult to see out of particularly at night and can make it difficult to know location, and also make it difficult to see into the vehicles at any time. In these troubled times this is also not a good security outcome." 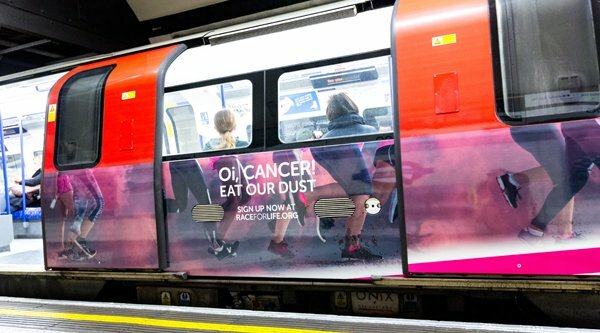 "We call for the immediate removal of advertising wraps from window areas on all public transport vehicles: trains, buses, ferries and trams." 1. SEQ: Can we please see out of and into buses, trains and trams! Tried to count how many people were on the 330 that was going through Chermside tonight so I could whinge about how buses aren't included in this holiday timetable. Didn't see anyone but the driver on it. Wanted to confirm but when it turned sideways I was greeted with a full body advertisement so I couldn't see in. Re: Australia: All we want for Christmas is clear windows ! It really is time to remove this advertising wrap from windows of public transport vehicles. Apart from the fact it is very disorientating to passengers and blocks visibility and location confirmation, it is a very major security risk. It is not possible to see into the vehicles. It will only take one security incident to be compromised by advertising wrap blocking vision to see it promptly removed. How about the authorities being proactive and removing it now? Before there is an incident. The only unwrapping public transport pundit Robert Dow wants to see this Christmas is on Brisbane's buses. Mr Dow, the public figurehead of public transport advocacy group Rail Back on Track, said advertising wraps on buses and CityCats blocked passengers' clear vision and constituted a "very major security risk". "It is not possible to see into the vehicles," he said. "It will only take one security incident to be compromised by advertising wrap blocking vision to see it promptly removed. "How about the authorities being proactive and removing it now, before there is an incident?" It was not the first complaint about the practice. Resident Derek Tinkler blasted the wrappings during a public address in the Brisbane City Council chamber last year, in which he said looking out the covered windows was like "looking through netting all the time". Mr Dow said Mr Tinkler's complaints were not uncommon. "We have had feedback from the public and members that these wraps do make it difficult to see out of, particularly at night, and can make it difficult to know location, and also make it difficult to see into the vehicles at any time," he said. "In these troubled times this is also not a good security outcome. "The advertising revenue gained from these wraps could be maintained by more appropriate advertising placement. For example, on areas of the vehicles away from windows, internally and externally. "We call for the immediate removal of advertising wraps from window areas on all public transport vehicles." But the council's public transport chairman, deputy mayor Adrian Schrinner, said just 4 per cent of the city's fleet were fully wrapped. Six of Brisbane's 21 CityCats were wrapped, along with 44 of the council's 1209 buses. "The wraps are all made from perforated material to maintain visibility through the windows for passengers and meet Australian standards," Cr Schrinner said. "In response to public feedback, the wrap material was upgraded late last year to a more transparent product that has more perforations and viewing holes per square metre. "Also, the past six Team Brisbane CityCats since late last year have had only partial or no wrapping over their windows." Those "Team Brisbane" CityCats included homages to the city's national sporting teams, along with other themes of civic pride. Cr Schrinner said that in the 2015-16 financial year, the council received $7.29 million in advertising revenue from all sources, including public transport. A breakdown of revenue for bus wrapping was not available, he said. Cr Schrinner said the advertising revenue was used to make improvements to bus services. Thanks Annie and ABC Radio for the opportunity to chat about wrap on windows of PT vehicles. 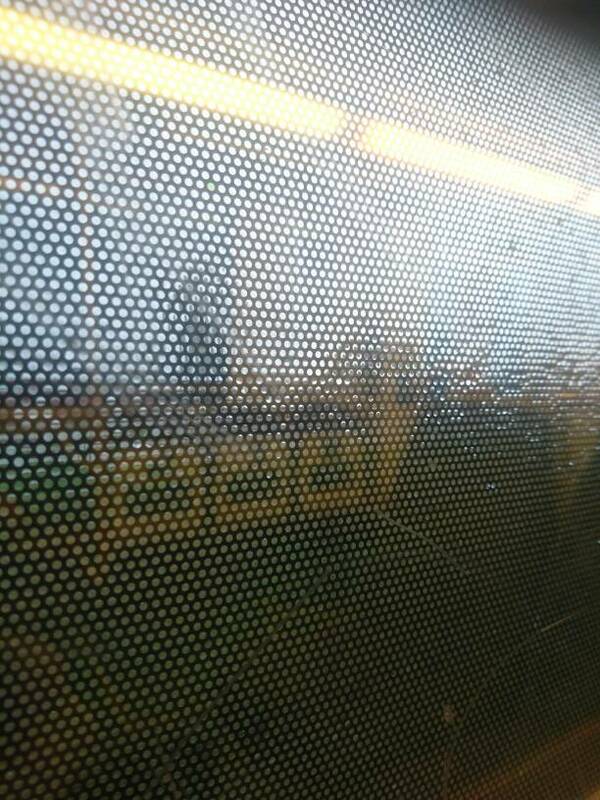 The problem of the wrap is exacerbated by the rain droplets on the outside of buses. We have constant feedback about the problems for pax. Disorientating, particularly when wet and night. PT vehicles are built with windows for a reason. It is so people and can see in and out of them. If that was not the case why build the vehicles with windows? Just build window-less tin cans. There are also rather significant potential security issues. You cannot see into the vehicle. and so preserve the ' precious revenue' . Ad wrap on windows is just another sign of the contempt the authorities actually have for passengers. It is our position that ad wrap be removed from the windows of PT vehicles. I noted when in Perth early this year that the PT vehicles there (trains and buses) do not have any adwrap blocking windows. Rather civilised. Do you realise just how little it brings in? 50% generally goes to the operator anyway, so TransLink's cut is half of bugger all. I've also seen just in the last few days a Sydney double deck bus with wrap advertising over the front upper window. Spew. The past few days more social media chatter concerning advertising wrap (ad-wrap) placed over the windows of public transport vehicles. This ad-wrap makes it very difficult and often impossible to see into a public transport vehicle from the side. It is also disorientating for passengers, particularly when wet and/or under reduced light conditions such as night or dull days. Also intending passengers cannot see into the vehicles to judge passenger loading. Public transport vehicles: buses, trains, ferries and trams are built with windows for a reason. It is not for covering up with advertising material. Otherwise the public transport vehicles would be built as tin cans - no windows at all. An on board security incident on bus or other vehicle could be seriously compromised as security forces cannot see into the vehicle. It also is obvious to anyone planning such an incident that they would choose a vehicle with windows obliterated with advertising wrap to gain a tactical advantage. Ad-wrap on windows of public transport vehicles must be removed, immediately. 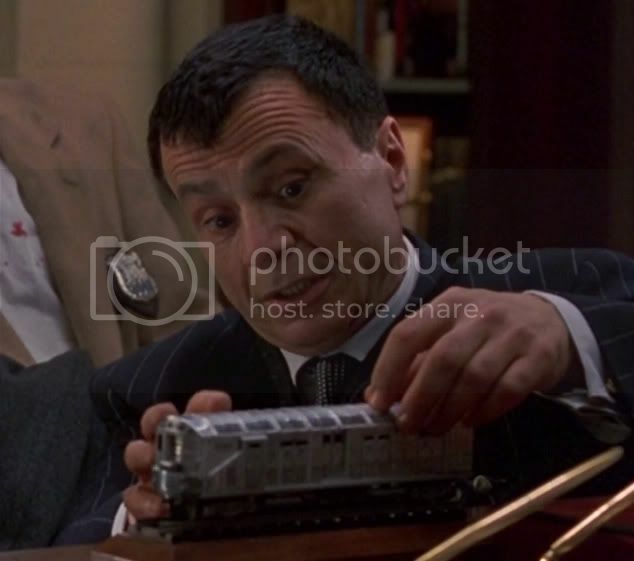 It is clearly unsafe and treats passengers with contempt. Here is a picture from London showing buses with appropriately applied ad-wrap, and Brisbane bus with windows blocked. The non view from inside a train with ad-wrap over windows. 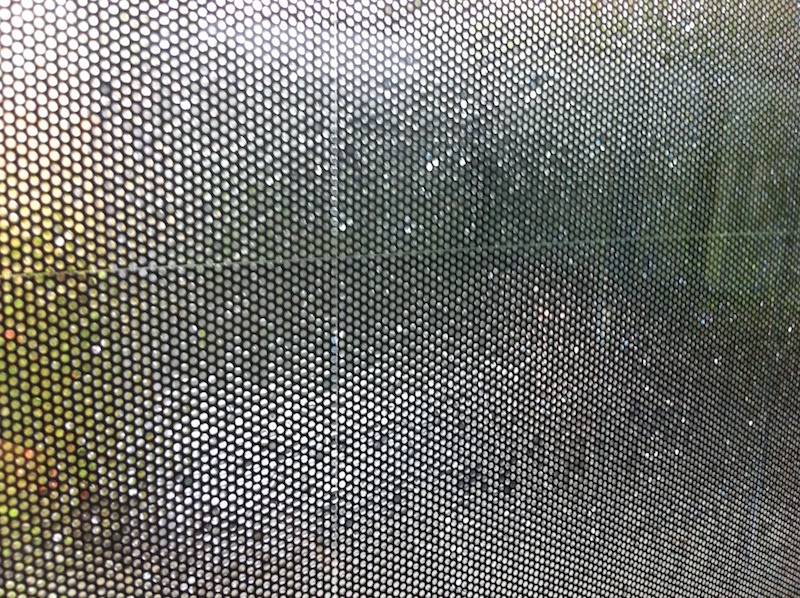 Advertising material can still be applied to public transport vehicles leaving windows clear. 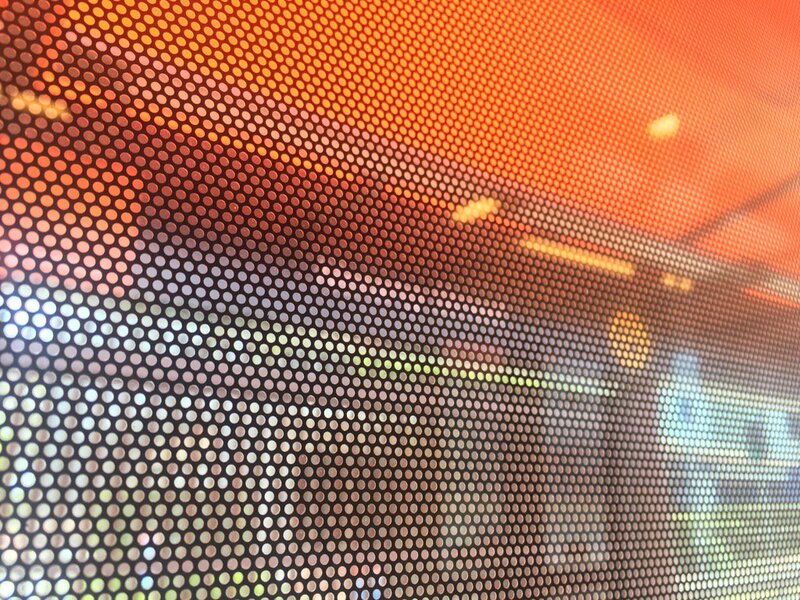 It is interesting to note that in Perth (Transperth), an enlightened public transport jurisdiction, there is no ad-wrap blocking windows of trains or buses. Bob I really appreciate your push to get windows cleared. I find it quite stressful to not be able to work out where I am. Makes for a more unpleasant journey. I will battle on till the right thing is delivered. Interesting to note that an International Transport planner visitor to our region highlighted the scourge of ad wrap in November 2016. 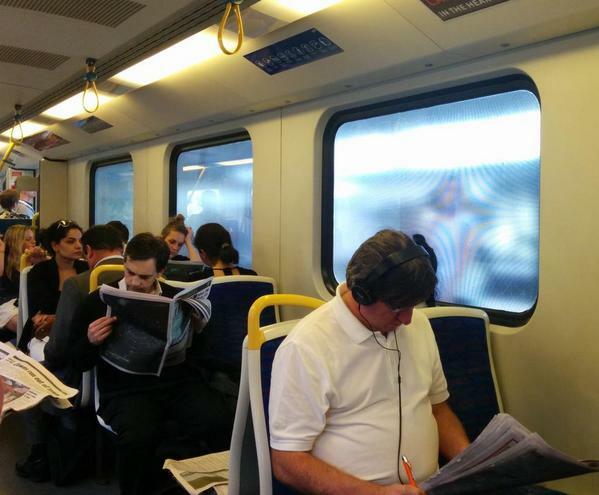 There are real problems with ad-wrap on buses, trains, ferries and trams blocking vision. Public transport vehicles are built with windows for a reason, so passengers can see into and out of them. Public transport vehicles are not built window-less are they? The windows should not be blocked. This is very disorientating for passengers, particularly at night and/or when wet, and also makes it very difficult if not impossible to see into the vehicle. The blocking of window vision could have very serious safety and security implications as well. We call on the Minister for Transport Ms Trad to direct that all wrap be removed from windows of all public transport vehicles. It is possible to have well placed ad wrap that leaves window vision intact. Other jurisdictions manage to do that. Is this too hard for Queensland? Ad-wrap blocking windows is measure of the ongoing contempt transport authorities have for passengers sadly. We are delighted that the Greens Candidate for Brisbane Lord Mayor Ben Pennings raised the issue of all over wraps on public transport vehicles making it difficult for passengers to know their location, particularly at night or when wet (1). There is also a potential security issue with all over wraps as it is not possible to see into the vehicle. A wrapped bus for example, would be a much more obvious target for evil doings than an unwrapped bus. We are just hitting our heads on brick walls in SEQ. A very disinterested transport elite that has completely rooted most things sadly.